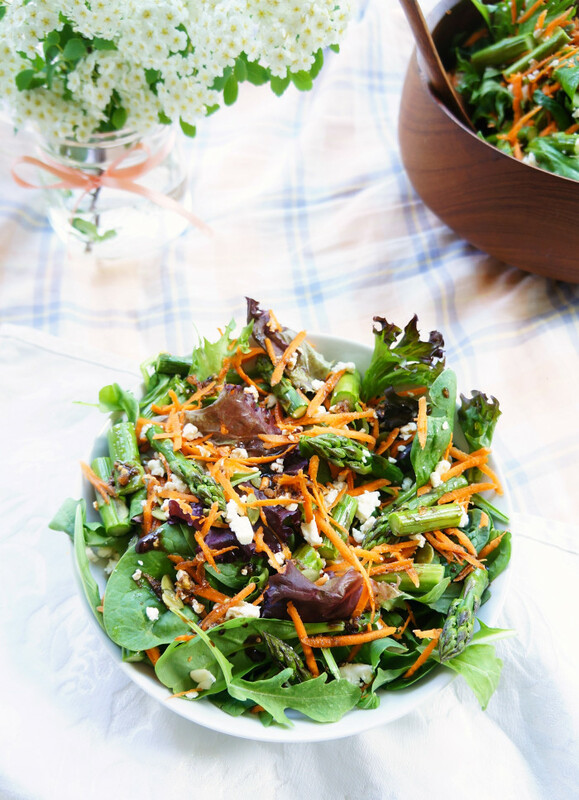 Gorgeous spring salad filled with roasted asparagus, pumpkin seeds, feta cheese and a balsamic vinaigrette. A vegetarian and gluten-free option! Today was a gorgeous, sunny and warm day. I love it when I have the day off AND it’s nice out. It just makes the day off so much better! 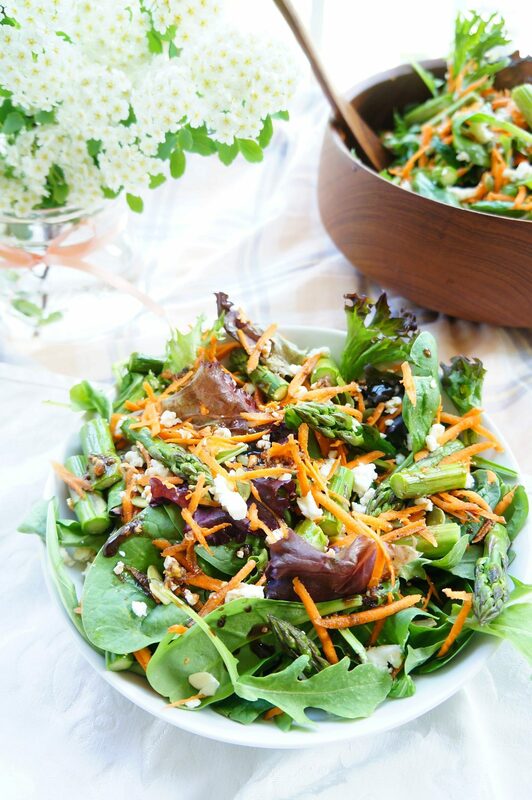 There’s something about warmer temperatures and sunshine that make me feel like light and refreshing food. After getting a good sweaty leg workout in at the gym, I came home and decided that for lunch, I was in the mood for one of my favourite spring salads. As I was feasting on my salad, I was trying to decide what I liked best about it. But you gotta think about something while you eat! So I did a salad analysis. Even on my days off, I find it’s hard to turn off my Dietitian brain. The crunch of the pumpkin seeds. The small chunks of feta cheese. So basically, through my analysis, I discovered that I pretty much like everything about this salad. I recommend that you try out this salad AT LEAST once this summer. Preheat the oven to 350 F. Place asparagus pieces on baking sheet and drizzle with a bit of olive oil. Roast in the oven for about 15-20 minutes. Meanwhile, in a small bowl, whisk together vinegar, lemon juice, maple syrup, mustard, garlic and salt. Slowly whisk in olive oil. Continue to whisk until dressing appears to be thickened. 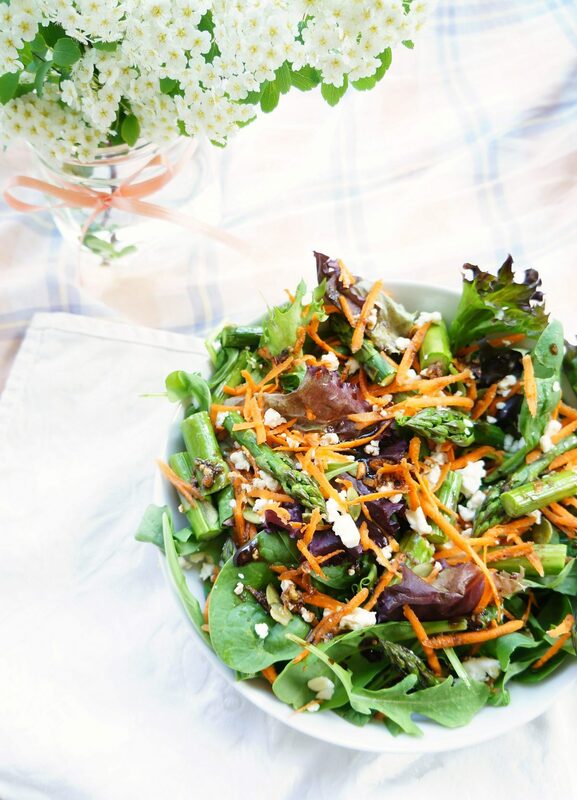 In a large salad bowl, combine spring mix, spinach, carrot and roasted asparagus. Pour half of the salad dressing over the salad and toss to coat. Sprinkle with pumpkin seeds and feta cheese (optional). Serve the remaining dressing on the side. P.S. 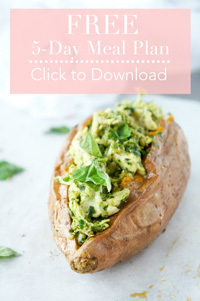 If you’d like to get more healthy recipes sent to your inbox, subscribe below to receive my weekly updates! 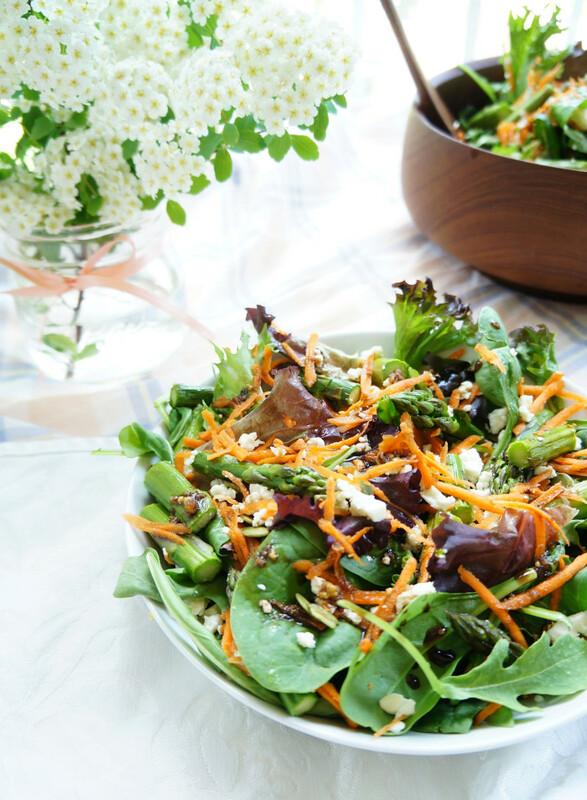 we are all about salads this summer – this looks fantastic! Beautiful photos! 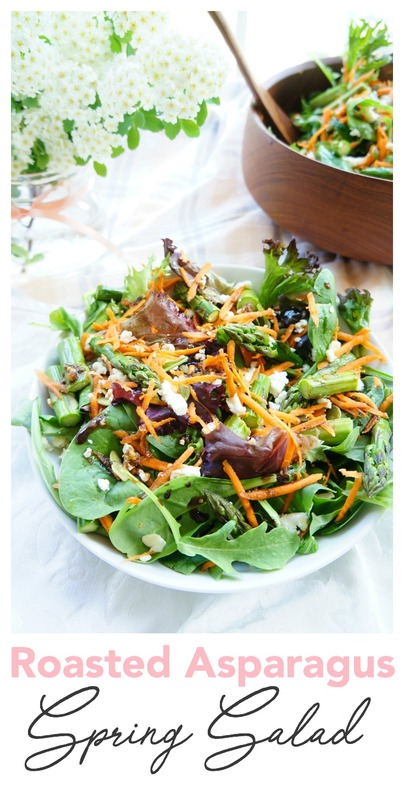 I love a good salad and this looks so delicious and refreshing. Thanks for sharing! Ok… I totally LOVE our analysis!! And looking at the ingredients I think you have on spot. Excellent salad! Haha thanks Kim! Always gotta analyze my recipes ;) Enjoy!